I thought today I would let you into my everyday makeup routine, and give you an insight into what products I'm using on a daily basis, step by step. Firstly, I start with my Concealer, and at the moment the Concealer I have been using is Boi-ing by Benefit. I use this on any blemishes or spots I may have. Sometimes I will need to cover a lot up, and other times I don't even need to use it if my skin's behaving! Next I go in with my Foundation, and the foundation I use is one I have been religiously using for the past three years and love so much and that is the Healthy Mix Serum by Bourjois. I honestly can't rave enough about this Foundation enough; it just does exactly what I want a Foundation to do. It's light, it covers my face, it gives a wonderful glow, and I actually really like the fruity smell. Nothing has even come close to beating this Foundation for me. After I have finished using my Concealer and Foundation, I powder my face to finish off my skin and get rid of any unwanted shine. The Pressed Powder of my choice at the moment is also by Bourjois and is the Healthy Balance Powder. Again, the same with the Healthy Mix Serum, this powder feels so light on your face which is such a great feeling. 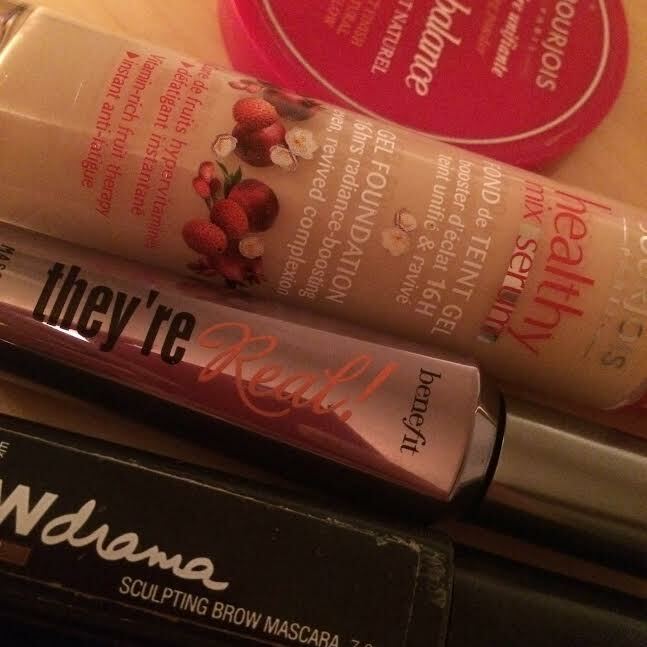 I then move onto my brows, to do my brows, I use a couple of products. First I will use the Maybelline Brow Drama Mascara, and then fill in any empty areas using my Benefit Brow-Zings kit. I keep my eyes fairly simple; however it does enhance the features my eyes have. The first thing I do with my eyes is apply some liquid liner on my top lid and flick it out in a cat eye style. To do this, I have been using the Stilla Stay All Day Liquid Liner lately. I'm a little bit unsure of this eyeliner, I had been previously using the Collection Liquid eyeliner, but I have found that the Stilla Eyeliner seems to dry up very quickly which is frustrating if you're in the middle of doing your eye makeup! After I have applied my eyeliner, I curl my lashes with a curler which is just one I got from Superdrug, when my eyelashes have been curled, I apply some Mascara. The Mascara I'm currently using is Benefit's They're Real. And that's it for my everyday look! Sometimes I may add a bit of blusher, bronzer, lipstick, or pencil eyeliner, but that's more for an evening look or special occasion. I hope you've enjoyed taking a peek at what products I use!